Eva Ruth Melton peacefully passed away October 19, 2018 at Brookdale Senior Living in Oak Ridge. The family would like to thank the many caregivers at Brookdale for their care over the past few years. Eva was born in Mohawk, Tennessee to parents Flora Kite Solomon and John Crockett Solomon. She was the youngest of her siblings, J.C. Solomon, Gleason Solomon, and Lucille Solomon Williamson. She graduated from McDonald High School in Greene County TN and received an Associate degree from Knoxville Business College. Eva married John T. Melton on Thanksgiving Day, 1950. They were married for 45 years before his death in 1995. After living in Knoxville and Chattanooga, they moved to Oak Ridge to raise their family. Eva was raised in the Baptist faith but was a member of First Cumberland Presbyterian Church in Oak Ridge for over 60 years. Eva was a homemaker and was always known to open her home to friends and family. 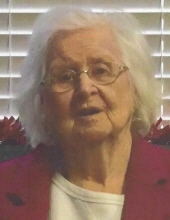 Eva is survived by her son, John T. Melton, Jr. and his wife Paula of Mount Pleasant, SC, and daughter Leslie Melton Irwin and her husband Michael of Knoxville, TN; grandchildren Ashley Melton Festa and her husband Andrew of Greer, SC; Ginni Melton Stevens and her husband Bryan of Cheyenne, WY; Jenna Irwin, and Mark Irwin, both of Knoxville, TN. Eva is also survived by great-granddaughters Delia and Delaney Festa of Greer, SC, and many nieces and nephews. Receiving of friends and family will be held Tuesday October 23 from 5:30 to 7:00 PM at Weatherford Mortuary in Oak Ridge. Graveside services will be held Wednesday October 24 at 10:30 a.m. at Oak Ridge Memorial Park. A guest book is available at weatherfordmortuary.com. To send flowers or a remembrance gift to the family of Eva Ruth Melton, please visit our Tribute Store. "Email Address" would like to share the life celebration of Eva Ruth Melton. Click on the "link" to go to share a favorite memory or leave a condolence message for the family.